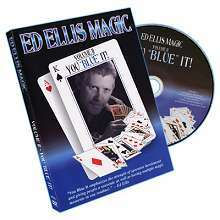 In September 2009 David Forrest released five brand new magic creations as individual, 20 minute video downloads. Dave could never have realised at the time that these five separate effects would collectively become one of his most succesful projects to date. The response from magicians the world over was simply incredible. 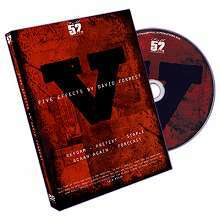 'V - Five Effects by David Forrest' is a DVD which brings all five of these show stopping effects together on one compilation disc. Viewers now have the convenience of having all the material together on one DVD and you can now comfortably view each effect on a full sized TV screen instead of the much smaller 'web based' videos of the original downloads. And, this compilation disc also represents tremendous value for money, costing only a fraction of buying the five downloads individually. What follows is a brief description of each effect followed by the comments of those who viewed the original downloads. These comments are unsolicited and were either e-mailed to Dave directly or posted on public internet forums. REFORM - A self working torn and restored card! This may well be the easiest Torn and Restored card ever created. With absolutely NO SLEIGHT OF HAND what so ever you cause a torn card to reform inside your spectators very own hand! 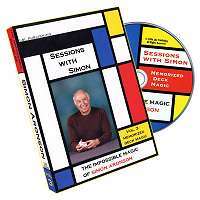 After watching this 17 minute download, describing everything in great detail, from the deviously simple gimmick to the 'self contained' set up, you will be carrying this pocket sized miracle with you EVERYWHERE. Get 'REFORM' today. By tonight, you'll be blowing people away - it's honestly THAT EASY! PRETEXT - Make impossible predictions! 'PRETEXT' is a multi-layered deception that will allow you to easily make the most incredible predictions! In the effect included in this 18 minute instant video download you produce a folded billet from inside your wallet that accurately predicts a persons name and a card that they freely named! 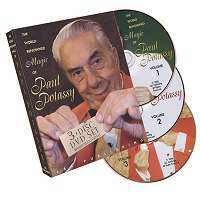 You'll soon realise the depth of the 'PRETEXT' system as it allows you to accurately predict practically ANYTHING during the course of a simple card trick in a way that appears so fair you won't believe it. This is the type of prediction that simply cannot be backtracked - your audiences will be left stunned as to how you could have made such accurate predicitons way ahead of time! STAPLE - A stunning transposition! Imagine this: You show your lucky Joker - it's folded and stapled firmly to the card case. A card is selected, let's say it's the Jack of Clubs. It is placed face up in the centre of the pack. With just a wave of your magic wand (Sharpie marker!) A face up Joker is discovered in the centre of the pack! On closer inspection it is found to be creased and bears little staple holes! When the card case is turned over we now find that the card firmly stapled to the card case is the Jack of Clubs! And, it can all be examined! This 13 minute video will explain everything you need to make the very cool gimmicks that make this insane transpo possible! In addition to the full routine outlined above the download also includes two more very cool, visual handling ideas! ACAAN AGAIN - Any Card At Any Number! Dave just can't leave this plot alone! Here, on this 12 minute video download you'll learn perhaps his boldest method to date! A regular deck is thoroughly examined and shuffled by a spectator. A freely chosen number between 1 and 52 is written on a business card. A freely chosen card is written on a second business card. Both of these are locked inside the card case. The performer takes the deck and deals until the number is reached. Sure enough, the chosen card is found at the freely chosen number!The best news? There is a very cool gimmick in play which makes this whole thing practically self working! FORECAST - A prediction deck! With the 'FORECAST' deck you'll be performing the most unbelievable prediction effects with the greatest of ease! In the first effect included on this 15 minute instant download, you accurately predict a card that will be freely cut to and then, unbelieavbly, a second card that was just NAMED! In the second effect a spectator chooses ANY CARD - a completely FREE choice yet you produce an odd backed duplicate of that card from your pocket! The download will tell you everything you need to know including details on how to construct your own 'FORECAST ' deck - don't worry - it's CHEAP and EASY and you'll most likely have everything you need already!